In early May the major Australian banks collectively reported profits for their last six months of A$15.3 billion dollars. This resulted in some media commentary about banks being too profitable, especially as three of the banks reported in the middle of the Royal Commission into the financial services industry, which had highlighted examples of inappropriate financial advice and problems issues with lending standards. Whilst large corporations generate large profits in dollar terms, what is often ignored in much of the debate on corporate profitability is that these profits have to be shared amongst millions of individual shareholders. For example, collectively the banks made $15.3 billion, however, divided by 10.8 billion bank shares outstanding this crude measure equates to a mere $1.42 per share. In this piece we are going to look at different measures of corporate profitability for large Australian listed companies, looking beyond the billion dollar headline figure. As a fund manager, the $4.25 billion of cash profit generated by Westpac over the past six months does not mean very much. As an investor, I am most concerned with the underlying earnings per share (EPS), which is what the owner of a single share of the company receives from the profit generated in a particular year. In Westpac’s case, their cash earnings per share compared with the first half of 2017 grew 4.3% to $1.25 – nice growth but not particularly exciting. We also look at growth in EPS, as often a company’s profits can grow substantially when they make an acquisition. However, if that acquisition is funded by issuing a large number of additional shares, profit per share might not actually grow. Conversely, a company’s profits may be down, but if this is due to the selling of a non-core division it could be a good result for shareholders. For example, earlier this month ANZ Bank reported a 16% decline in cash profits due to the sale of their Asian retail banking businesses. As the proceeds from the sales were used to buy back ANZ Bank shares, their earnings per share actually gained 4%. Additionally, at a company level, we also look at measures such as returns and profit margins, which can be better measures of how efficient a company’s management team is in generating their annual profits. Furthermore, these measures allow the investor to compare different companies in similar industries. Return on Capital Employed (ROCE) looks at the profit generated both by the capital that the equity holders have contributed to establish the business, as well as the debt taken on to support the business’ activities. ROCE is calculated by dividing a company’s profit before interest and taxes by the shareholders’ equity plus debt. The investment by shareholders includes both original share capital from the IPO plus retained earnings. Retained earnings are the profits kept by the company in excess of dividends and are used to fund capital expenditure either to maintain or to grow the company. Companies with high ROCE typically require little in the way of equity to keep the business running and little need to borrow from their bankers. an internet services companies (REA and Carsales). The common factor in these businesses is minimal ongoing capital expenditure to run the company. Bringing up the rear are a range of capital-heavy businesses that require both large amounts of initial capital to start the business and regular capital expenditure to maintain the quality of their assets and finance their ongoing activities. This subset includes a gain handler (Graincorp), logistics (Qube), retailer (Myer), healthcare companies (Healthscope and Primary), and an energy company (Santos). 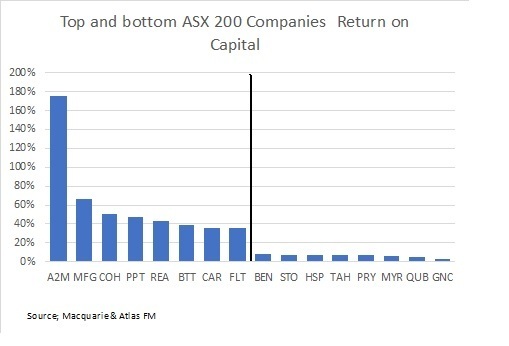 Typically when looking at this measure, miners, steelmakers, wineries and Qantas are prominently featured amongst the lowest returning businesses as they are operating in capital-hungry industries. However, in 2018 these three industries are currently enjoying cyclically strong earnings. Profit margin is calculated by dividing operating profits by revenues. It measures the percentage of each dollar received by a company that results in profit to shareholders. Here we have used earnings before interest, taxes and depreciation as it allows us to compare companies across different industries with different capital structures, and this margin is for the six months ending December 2017. Typically low margin businesses operate in highly competitive mature industries. The absolute profit margin is not always what investors should look at when analysing a company’s results, but rather a change in this margin. A rising profit margin may indicate a company enjoying operating leverage as profits are growing at a faster rate than costs. Conversely, a declining profit margin could indicate stress and might point to large future declines in profits. 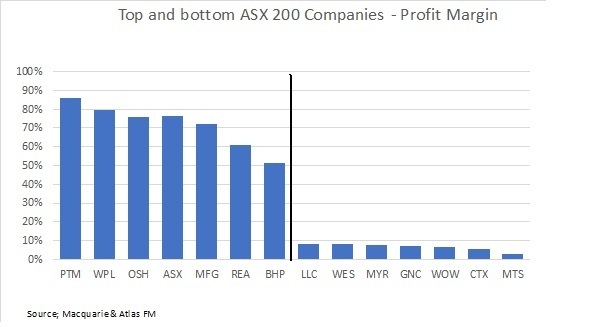 From the above chart, the highest profit margins are generated by companies that are fund managers enjoying the operating leverage mentioned above (Platinum and Magellan), monopolies (ASX), internet businesses (REA), or energy companies (Woodside and Oilsearch). The energy companies enjoy a high-profit margin, as once the large offshore LNG trains are built these assets have a low marginal cost of production per barrel of oil. Obviously, this metric does not account for the tens of billions in capital required to build these giant projects. BHP features in this list courtesy of the 60% profit margin that the Big Australian earns from digging up iron ore in the Pilbara when iron ore prices are around US$70 per tonne. Low profit margin companies characteristically receive large revenues but operate in intensely competitive industries such as petrol retailing (Caltex), grocery retailing (Metcash, Woolworths and Wesfarmers), department store (Myer), and construction (Lend Lease). While the banks and the large miners (BHP and RIO) generate large absolute profits resulting in headlines around the billions of dollars they earn, they are generally not among the most profitable large listed Australian companies in terms of profit margins and returns on assets. Over the last six months, Commonwealth Bank’s 48,900 employees produced a $4.7 billion profit, but this represented a return on assets of 1.03% and a profit or net interest margin of only 2.16% on a loan book of $962 billion. When looking at companies to include in the Maxim Atlas Core Australian Equity Portfolio, the indicators of earnings power that we look at is not the headline number, but rather its return on capital or equity and changes in profit margins.